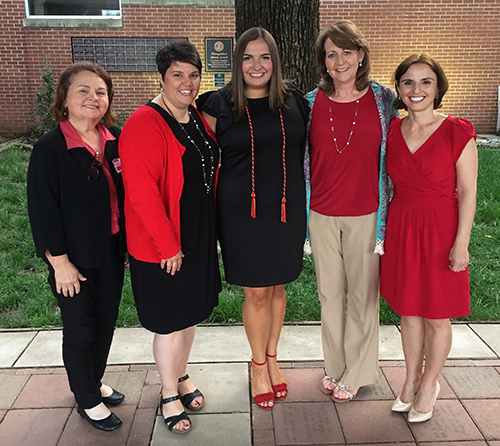 Grace Davis, center, is flanked by instructor Cathy Hale, from left, her mentor; Elizabeth McKinley, nursing academic coordinator; Allison Scott, assistant professor of nursing; and Kate Mamiseishvili, associate dean for academic and student affairs. Grace Davis, who will graduate from the University of Arkansas tomorrow with a Bachelor of Science in Nursing degree, was honored May 3 as one of 22 students in the Razorback Classics Class of 2018. The Arkansas Alumni Association announced the group of 11 male and 11 female top graduating seniors earlier this year. They were selected from the 71 Seniors of Significance recognized in the fall of 2017. A selection committee of more than 100 University of Arkansas advancement staff, former and current Arkansas Alumni Association National Board members, and past award recipients scored each applicant based on academic excellence, demonstrated leadership and campus or community involvement. The 22 students and their mentors were recognized at the Cardinal & White Banquet on May 3 in Boyer Hall of the Janelle Y. Hembree Alumni House. Mentors, chosen by the honorees, are individuals who have made an impact on the students during their time at the University of Arkansas. All of the Razorback Classics will be featured in the Razorback Yearbook and receive a special honor cord to wear at commencement. Davis, of Memphis, has accepted a position at the Mayo Clinic in Rochester, Minnesota, working in the oncology and hospice unit. She completed a 10-week summer externship last year on the unit. She served as vice president of the Student Nurses’ Association at the U of A and helped the chapter achieve Stellar School status from the National Student Nurses’ Association. The Eleanor Mann School of Nursing is based in the College of Education and Health Professions.